La Societe des Quarante Hommes at Huit Chevaux is an independent, by invitation, honor organization of male and female U. S. veterans, more commonly known as theForty & Eight. 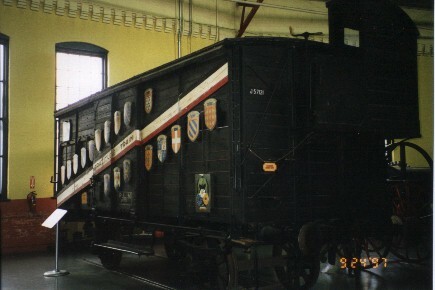 The Merci Train was a train of 49 French railroad box cars filled with tens of thousands of gifts of gratitude from at least that many individual French citizens. They were showing their appreciation for the more than 700 American box cars of relief goods sent to them by (primarily) individual Americans in 1948. The Merci Train arrived in New York harbor on February 3rd, 1949 and each of the 48 American states at that time received one of the gift laden box cars. The 49th box car was shared by Washington D.C. and the Territory of Hawaii. To download the Forty and Eighter you will need Acrobat Reader. If you don't have it click the icon below and download it.